Wine, beer and spirits, are all Free. 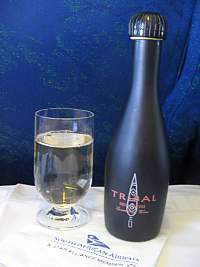 All wine in economy comes in 187ml bottles. SAA have regular wine awards and tasting selections to find the best wine. Airreview is a non-commercial, not for profit blog, written by a non-trading individual, which does not market or promote any product listed on this page, and does not make any direct or indirect commercial use of any name, and as such assert my rights as an individual writing a (non-marketing) review to be exempt from the relevant parts of Australian RSA regulations, UK licencing laws, and EU laws regarding alcohol, promotion, designation, and marketing. Also note that some products listed here are no longer sold, and some have either changed their name, product line, designation, area, or some other facet of their product. As such these wines, beers and spirits must be legally viewed within a historic context, in some cases dating back over two decades, when the product could legally be called and promoted under its original designation. Airreview promotes the responsible use of alcohol, and also respects the legal drinking age in countries where it is restricted. Airreview aims to correct innocent mistakes as soon as they are pointed out, and apologises for inadvertent omissions, but will not pay your costs in this respect. Correspondence on this matter will not be entered into. By browsing this site you agree to these terms and conditions. It reveals a delightful melange of sweet, fruity flavours suggesting hints of strawberry and plum. Low in alcohol, this is a truly a sparkling wine to add exuberance to any occasion. The grapes are sourced from selected established vineyards in the Stellenbosch area planted between 1974 and 1982 at altitudes ranging from 160 to 215 metres above sea level to impart complexity to the wine. 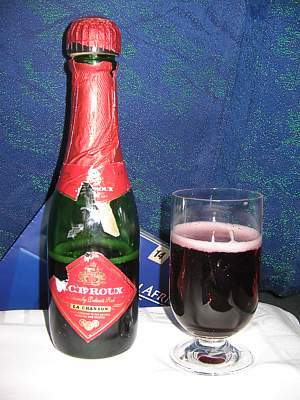 The sparkling wine is made predominantly of Pinotage grapes blended with other red varieties such as Shiraz and Cabernet Franc. The grapes are harvested by hand at 21.5 to 23.7 Balling and placed in small baskets to prevent bruising. The colour is extracted from the skins during the first 24 hours in the cellar. After fermentation for 7 days, the sparkle is created by impregnating the wine with CO2. From the Terroir vineyards, it is one of the world’s largest exporters of South African wine, has just launched a new high-tech, 4-million-litre wine cellar, known as Sonop Cellar, built on an 85-hectare, 100% organic estate in Paarl, South Africa. This is a sparkling wine with a striking packaging that resonates the indescribable African rhythm that is so unique. Great packaging, but alas the wine inside it is pretty poor. Pretty sweet, with the aroma of apricots and peaches. Very good. Beer comes in just one variety. Castle. Castle Brewery is one of the oldest commercial breweries in South Africa. As company-endorsed legend would have it, the company was founded by the aptly-named Charles Glass in Johannesburg in 1894. It later merged with other breweries to form South African Breweries, which still later merged with Miller of the United States to form SABMiller. 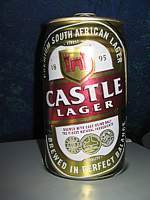 The main brand is Castle Lager, first brewed in 1895. Castle Lager has won many awards, from gold medals to the "World's Best Bottled Lager" award at the 2000 International Brewing Industry Awards. The lager has 5% ABV with a unique light hops taste, advertised as "somewhat dry, somewhat bitter, never sweet" and as "the beer that stood the test of time".